Regrettably ASTI has also notified the Board of Management of a Strike Day on November 8th. If this strike day goes ahead as planned the Board of Management will not be in a position to discharge its responsibility with regard to the care of students in its charge. 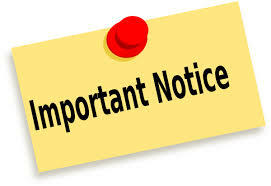 The Board of Management is therefore requesting you not to send your son/daughter to school on November 8th. The Board of Management will notify parents of arrangements regarding any further strike dates as they arise. The Board of Management regrets this course of action is necessary. The Board has no wish to interrupt the education of students in this school.